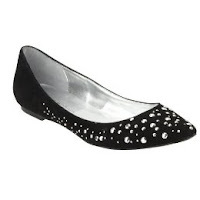 I really, really wanted these silver, studded black flats designed by Sigerson Morrison for Target. It came out last Sunday, October 12th, and it only costs $29.99. I asked my friend Michelle to bring me to Target that same day but somehow I couldn't find it in the Diamond Bar, CA store. Checked out some blogs today and found out it is available only online! Hay naku. After looking through the website, I found out the silver ones were SOLD OUT. I got the purple studded ones instead. I am excited! Sam, it sounds like you really listened to His voice and saw that He was showing you to buy the purple one and you obeyed lol You go girl! Miss you! And all I could say to Him was AMEN! I finally got to wear the shoes today. They are so lovely!! Miss you too. Hope to see you when we get back to that side of the world.